Hey guys! Sorry I've been MIA... I had 2 amazing trips to see family, spending a week in VA Beach with my in-laws and the next week in NJ with my family. I am excited to be back and have a list of some GREAT posts and guest bloggers coming up! Without further adieu... the five minute manicure I talk about all the time! Recently I've had a lot of people ask me about my nails, or just make comments about how they wish they had the time to do their nails. I've also had a few comments about how it's "obvious I don't have children" by the way my nails look. Well yes...I don't have children, correct. But that shouldn't stop women from taking pride in the appearance of their nails. With a 5 minute manicure, there's no excuse for NOT painting your nails! I started doing this manicure while I was working full time, and would paint my nails laying in bed at night, making it the last thing I did before going to sleep. <*GASP! *> It's ok...with a few tips and tricks, you can too. And wake up in the morning with your nails still perfect and smooth. Start off with clean, dry nails. -Base Coat: Deborah Lippmann Rehydrating Base Coat available here. -Top Coat: Seche Vite available CVS, Target, Ulta, Sally Beauty, etc. Here is a brief tutorial on how I shape my nails. Not included in the mani, but for an FYI. I'll include more details about this in a more in-depth nails post in the future. Start on left wall, move to right wall of nail, and finish off straight up and down on the tip. This is for SQUARE tips. A base coat is IMPERATIVE. This protects your nails from the chemicals in the polish, prevents staining from the polish, and most importantly allows for a smooth finish. I choose to use this base coat, but it is a tad expensive. I paid $18 for it, but any Sally Hansen Base Coat will do. I also use a base coat called Nail Magic that I bought at Sally Hansen which is good for splitting nails. I probably paid maybe $8 for it. Sorry for poor quality photo..
Second Coat: 1:22. Wait about 30 seconds, and apply Second Coat. Top Coat: 1:48. 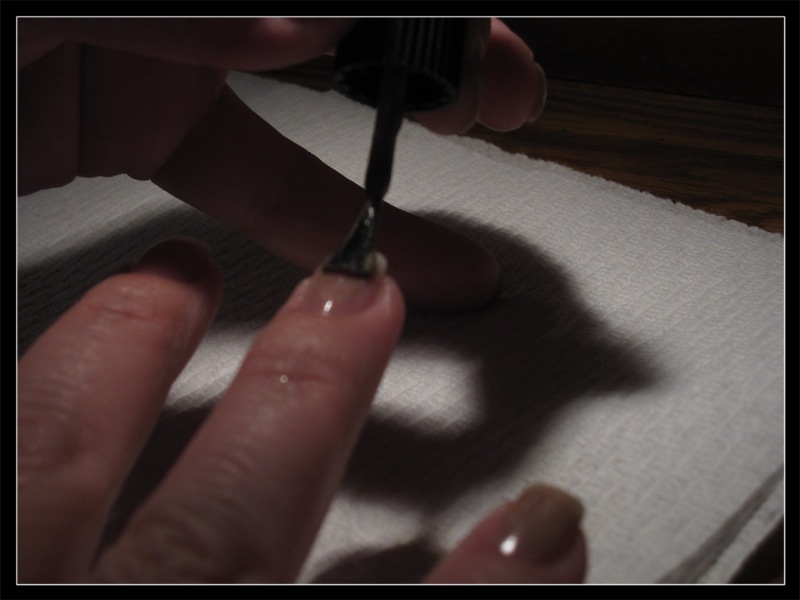 Again, wait about 30 seconds before applying Top Coat. Tada! DONE. All told: 5 minutes, 50 seconds. This was timed as you can see, but between adjusting the camera, lighting, setting the timer, and actually painting my nails, it may have added some time. The secret to this ENTIRE manicure is the top coat. This top coat is the most amazing product out there for nails, and I HIGHLY recommend you purchasing it. Seche Vite dries your nails SO quickly and efficiently, with the most gorgeous shine, and allows you to go about your day. You're technically done at this point, but if you're a little OCD, you can clean up the edges as seen in my photo. Since this is meant to be a quick mani, I will save the technique for the in-depth nails post. Honestly though? Within 1-2 hand washings or a shower, this flakes off your skin easily anyways. What do you think? I am in LOVE with this color! LOVING YOUR BLOG and I must learn to do my nails like you! Thanks lady, right back at you! I see your blog on my reader! I'm thinking of having a Tea & Tips Manicure Tea Party- I'll send the info your way!! Uhm Love, I really need to get that top coat!